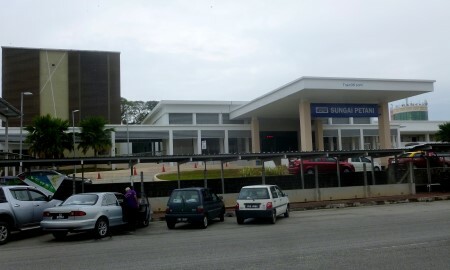 The Sungai Petani Train Station in the state of Kedah, Malaysia, is located in the centre of town on Jalan Market, with the main road running through town - Jalan Ibrahim - located to the rear of the station (use the pedestrian bridge to the south of the station to cross over the tracks). The train station is also conveniently located just a couple of minutes walk away from the Sungai Petani Bus Station (Express Buses). To get to the bus station, just turn right when leaving the main station entrance, walk past the market and the bus station is on your left just before the traffic lights. If you are looking for a hotel near to the Sungai Petani Railway Station, the 3 star Seri Malaysia Hotel Sungai Petani is located just across the road to the left as you come out of the main entrance. For other places to stay, it is best to cross over the tracks and go down the main road where there are a number of other places to stay close by. 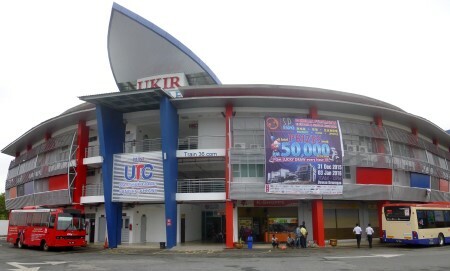 Sg Petani station is serviced by both the high speed Electric Train Services (ETS) and Komuter Trains. The Komter Utara (Northern Commuter) train services operate from Padang Besar on the border with Thailand, taking the branch line to Butterworth Penang. If you want to travel further south by KTM Komuter, you can change trains at Bukit Mertajam where there are services to Padang Rengas in Perak. ETS (Electric Train Services) travel from Padang Besar to the north and to Gemas in the south. From Gemas you can connect to Shuttle traisn to Johor and Singapore. All Intercity Express Trains to/from Sg. Petani are now cancelled. The old International Express to / from Butterworth to Bangkok in Thailand now departs from the border at Padang Besar.